The Boeing 737-800 aircraft touched down at Kamuzu International Airport at about 12.30 pm on the 13th of June 2014. The plane’s door opened and I walked out to step on Malawi soil for the first time in my life. I had just arrived from my home country, Kenya, to pursue a master’s degree in Aquaculture at Lilongwe University of Agriculture and Natural Resources (LUANAR), thanks to the Intra-ACP Mobility Project that awarded me a scholarship. My MSc study at LUANAR has greatly reshaped my career and opened doors to another world. The design of the Intra-ACP Academic Mobility Scholarship did not cover research costs, but adequately catered for tuition, travel and living expenses. I was therefore privileged to secure another award, a Field Attachments Program Award (FAPA) from the Regional Universities Forum for Capacity Building in Agriculture (RUFORUM). This award (RU FAPA 2015 086) was a very a timely compliment to the Intra-ACP Scholarship and helped me carry out my research. My research project, titled “Effect of dietary spirulina (Arthrospira platensis) supplements on growth, hematological factors and survival of Oreochromis shiranus challenged with Aeromonas hydrophila” has equipped me with a wealth of experience that will help me contribute to the expansion of aquaculture within and outside Kenya. During my time in Malawi, I have developed an incredible network of friends, peers, and professional contacts and have gained skills in conducting research studies, literature search, analyzing and summarizing data. I have gained experience in feed processing and storage, removal of anti-nutrients in fish feed ingredients, fish feed formulation, and proximate analysis of nutrients in fish tissue and feed ingredients. Furthermore, my project research exposed me to the analysis of growth models and feeding experiment protocols in fish. I am also well versed in sterile microbiological techniques, DNA and RNA extraction, spectrophotometry, use of a haemocytometer, microscopic investigation, aseptic technique, and bacterial isolation and cultivation. Otiato Siringi is a Kenyan-born and based specialist in education, horticulture and aquaculture. 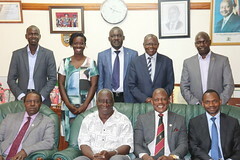 He holds a Bachelor of Science Degree in Horticulture from Jomo Kenyatta University of Agriculture and Technology (JKUAT), Post Graduate Diploma in Education from Kenyatta University and, more recently, Master of Science in Aquaculture from Lilongwe University of Agriculture and Natural Resources (LUANAR). Joash previously worked as a high school teacher at Juja Preparatory and Senior School, Kenya, where he taught biology, chemistry and agriculture.